You may not agree, but trust us, you’re going to want to. It seems that caulking your toilet to the floor has drawn quite a debate among clients, plumbers and DIYers of the like. Is it smart to caulk your toilet to the floor, or just leave it be? Turns out, caulking your toilet to the floor is actually smart. The debate has to do with leaking water. According to Structure Tech, people will bring up the argument that not caulking a toilet can help for when a toilet is leaking. These clients say that caulking a toilet would trap water from a leaking toilet, causing damage below and around the toilet since it has no place to leak onto the floor. Although that theory makes sense, it is, in fact, a false statement. A toilet would actually never leak right onto the floor. If there is any leaking that occurs in a toilet, it would happen through the floor and not on the floor. Toilets tend to leak below (typically into a basement), and seeing cases where a toilet is actually leaking on to the floor is quite rare. Plus if you’re dealing with a leaking toilet, simply wiping up the leaking mess won’t do it. There’s so much more that goes into repairing a leaking toilet. However, this doesn’t cover the reasoning behind caulking a toilet to the floor in the first place. 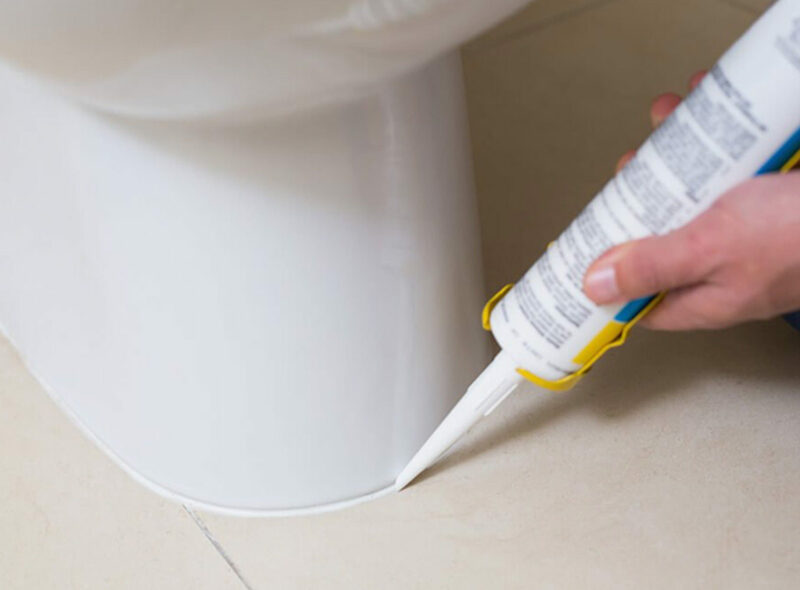 There are two important things to consider when it comes to caulking a toilet to the floor. Yes, the bathroom is a place to get clean, but it can easily be a place to trap some pretty foul smells. If you don’t caulk a toilet to the floor, you could find yourself smelling leftover residue from smelly mop water, tub water, or even worse, the remnants of your son’s potty training. Didn’t think you needed to worry about the toilet moving around? Think again! Caulk keeps your toilet secure the floor, and avoids any chance of injury or toilet malfunctioning. It’s actually required by the International Plumbing Code to caulk a toilet to the floor, and now knowing the reasoning behind it, why would you not want to? It helps to create safety in the bathroom and even provides sanitary protection. So if you haven’t done so already (or you’re about to replace a toilet altogether), here’s how to caulk a toilet to the floor.